Bryan Municipal Water Department is beginning its spring water main flushing program next week. The water crew will flush the larger transmission mains (12- and 16-inch) first and then, flush the smaller distribution lines on the side streets. Some city water customers may have rusty or discolored water during this time. In most cases, the condition is temporary, and water quality will return to normal as flushing in that section of the city is completed. Echler recommended residents flush their service lines by running water in the bathtub. Although the discolored water is not harmful to drink, it may stain light colored clothes washed in it. For this reason, it is recommended that clothes not be washed during regular working hours while the flushing program is being conducted. It takes the water department three to four weeks to complete flushing the city’s water distribution system. The flushing is necessary maintenance to ensure the availability of high quality water. 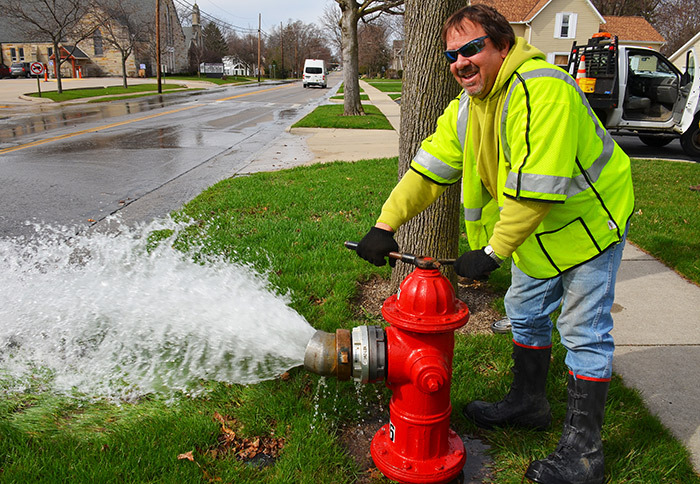 SPRING CLEANING – BMU Water Operator Gus Hulbert flows a fire hydrant on Center Street to flush the water distribution pipes and ensure fresh, high quality water in the system.